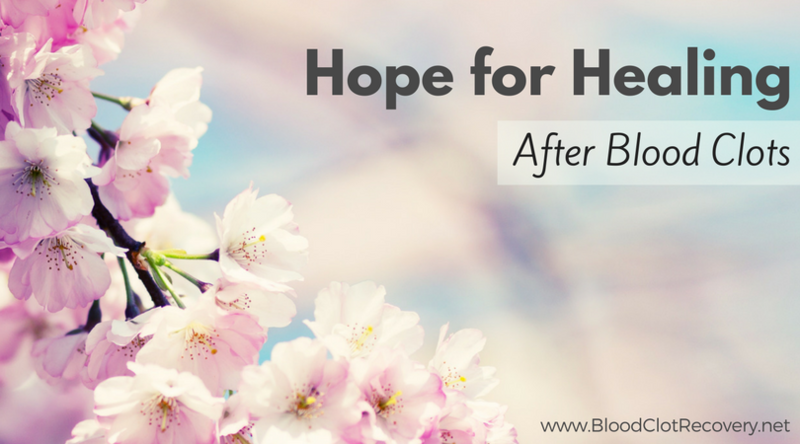 I have talked about hope for healing since I first started writing this blog, Blood Clot Recovery Network. I also talk a lot about not being alone during recovery from blood clots. It seems that these thoughts have always been a part of this space, but honestly, I didn’t have hope that I would heal when I started this blog, and I was entirely alone. Not many people were talking about blood clot recovery and if they were, I hadn’t found them yet. Still, I couldn’t get these words out of my head, and they became a founding focus of the work that I do here. I said them all the time – out loud and in my writing – perhaps believing that if I said them enough times, they would in fact become truth. 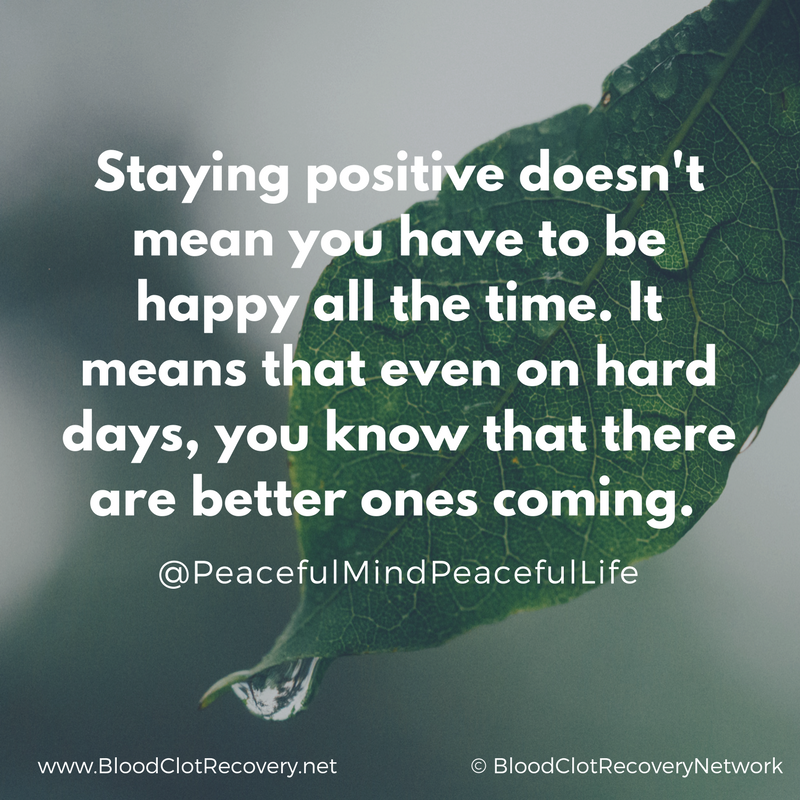 Throughout my personal recovery, I often heard, “You’re so positive,” and “You’re handling this so well.” In reality, my world was falling apart. My job, my relationships, my health, and my self-esteem where all in jeopardy, and there was not a whole lot that I could do about it. It was all out of my control. I don’t routinely consider myself positive – because I am not happy and outgoing all of the time – but most people would consider me an optimist. What I realized after I healed from my blood clots was that even though I wasn’t happy – and I certainly wasn’t optimistic – I was always hopeful for what the future held. I never stopped believing that better days were coming. I realized that I didn’t have to be happy to be positive. In fact, I was downright distraught over my situation. Having hope, though, even when I was hurting inside, was a positive way to handle a difficult situation. Looking back, I have handled most difficult situations in my life by remaining hopeful for a better future. From where I am today, the words “there is hope for healing” make more sense than ever before. Without my blood clot experience, I would not be where I am today. Now, I am not sorry that my blood clot happened to me, but it has taken me years to understand that, and it wasn’t an easy conclusion to come to. After all, it’s incredibly difficult to be grateful for something that almost ended my life and caused many years of hardship and heartache. Despite all the pain I went through, I still choose gratitude for my situation. Without my blood clot, I would not have had the chance to share my story, and with it, to share life-saving information about blood clots. I would not have the opportunity to meet all of you. Without my blood clot, I would not be able to pursue my passions as a writer and as a communications professional. I would not have the career I do, or the opportunity to give back to the community that has helped me heal. 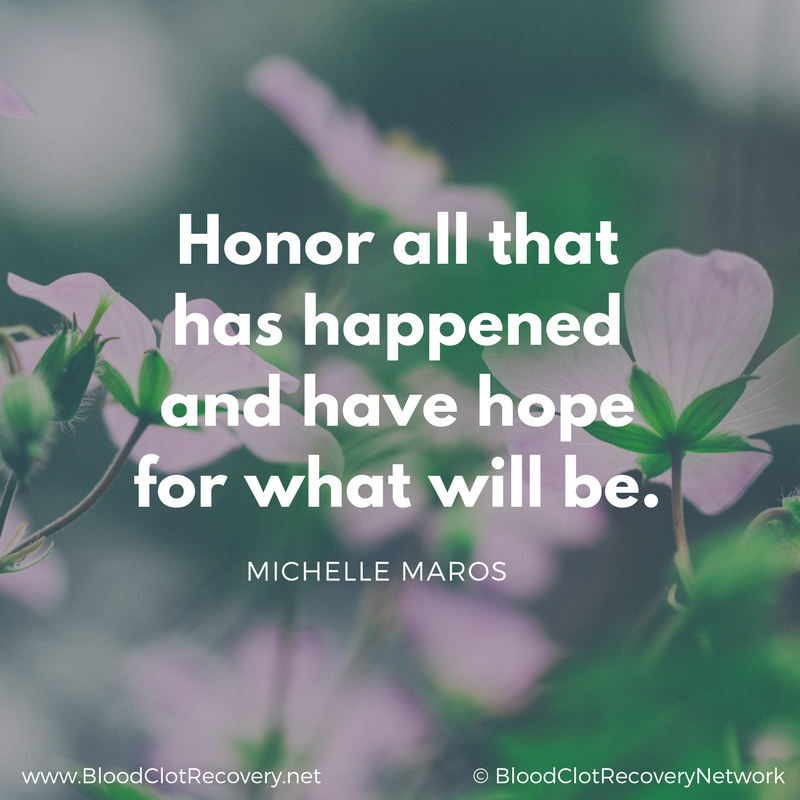 Ultimately, without my blood clot, I would not be able to share hope for healing with the people, who find themselves as alone as I felt when I was recovering from blood clots. I am grateful for what happened to me, because of where I am today, and because I can work each day to make a difference in the lives of other people who are suffering and hurting. Gratitude, though, didn’t happen overnight, and it doesn’t make everything effortless, either. I still struggle to this day from time to time. I wish I didn’t have to deal with the long-term consequences of a serious health condition. I still have anxieties and fears that will always be present to some degree. What if my blood thinner doesn’t work? What if I have another blood clot? What if a bigger, scarier health crisis happens to me that I am unprepared for? Those thoughts are still present in my mind from time to time, but I have hope that I can handle whatever comes my way, because I have already handled this. Gratitude for my experiences took years to happen, and it was very much a part of my healing process. In the beginning, I hated what happened to me. I was angry. I thought the pain would never, ever end. I wondered “why?” for years, before something finally shifted in my mind. That shift was towards hope. I began thinking about what was ahead, not behind, for me. I began to hope that there was something out there for me. I began to hope that the pain and suffering I was experiencing was not my final destination. I stopped asking “why,”and I started hoping for a different outcome. In time, why didn’t matter so much anymore. How began to matter more. How was I going to feel better? How was I going to deal with it if I didn’t feel better? And ultimately, how was I going to take what I went through and make a difference? I didn’t know how, nor did I have an answer to any of my questions, but I started to have hope that I would find the answers, or perhaps that the answers would find me. To my complete amazement, things started to turn around, for the better. I didn’t believe it at first (it was too good to be true). As I built this space and this blog, I started to realize that I was not alone. I received countless messages from people who said they were going through the exact same things that I was. People began sharing their pain, and their heartaches with me. People also shared their successes and progress with me. People started telling me that they hoped because I had hope. They said because of me and my experiences, they didn’t give up. I began to see how, and then one day I understood why. It became immediately clear to me why I went through what I did: I was meant to make a difference in the lives of people who were suffering with blood clots as I had. The more I gave, the more I received in return. The cycle of hope and healing has unveiled some unbelievable outcomes for not only myself, but for many of you as well. I know because you tell me each and every day how something I have written, something you read in the BCRN Facebook Group, or on the BCRN Facebook Page, has made a difference for you. Time and time again, you have told me that the stories of hope and healing have cleared the path for these same gifts in your own lives. Hope and healing from blood clots can be yours, and you do not have to suffer in silence, and alone. Honor where you have come from, and what you have been through, because you have been through a lot. Your body may be broken, but it is strong. Your mind may be devastated, but it is resilient. Be kind to yourself. Love yourself. Love your body because you’re still here, and it’s still healing. Healing is a process, it takes time, and it must be respected. Have hope for the future and what will be. Have hope for better days, less pain, clarity, confidence, dreams come true, and yes, have hope for healing. Have hope because you are a valuable individual, who has something to give and get from this world. Hope is a gift that you all have access to right now, in this very moment, simply by changing the course of your thoughts. If you can’t hope for yourself, I hope for you. I hope for better days ahead. I hope for healing, and I hope that you will be reminded that you are not alone on this journey. 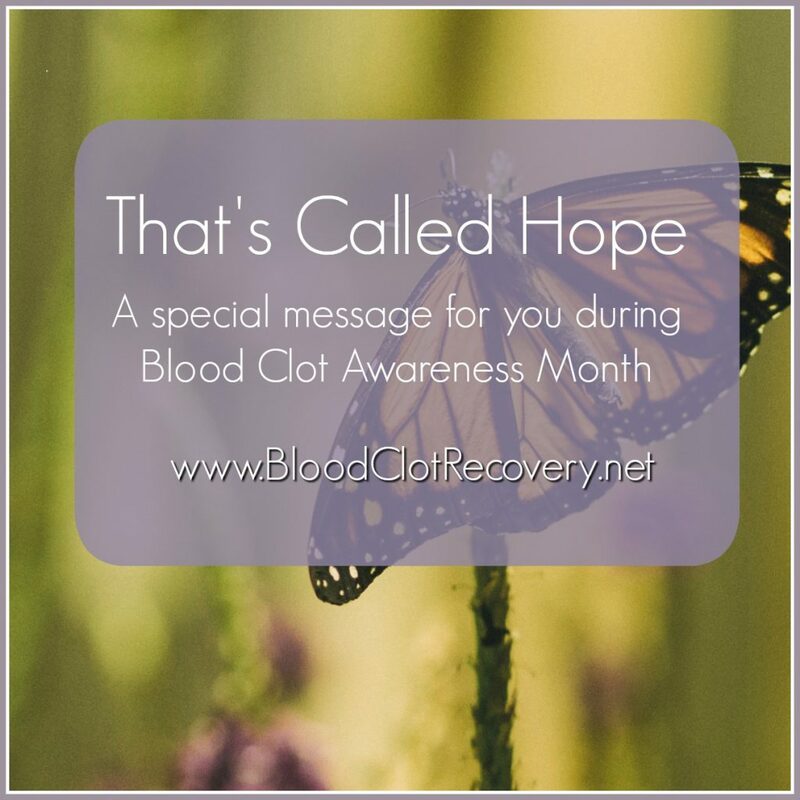 Reader Writes In: How have you found hope for healing after your blood clot? What words of encouragement can you share with others?